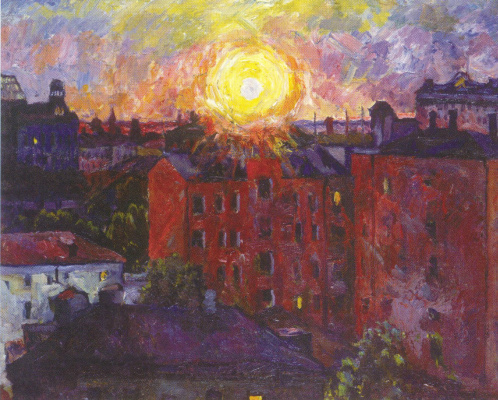 Aristarkh Lentulov, nicknamed the "painter of the sun", wrote the sun my whole life. Sun light and sound are the two main distinguishing quality of his paintings. 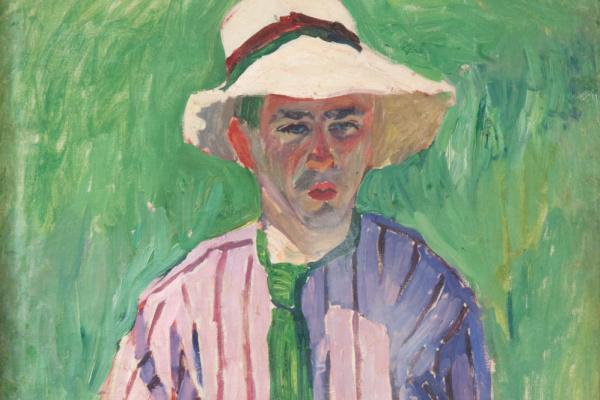 American expert on Russian art, art historian John Boult sure Lentulov Russian painting — the figure of the same scale that Matisse for the world. Aristarkh Lentulov was born in the family of a priest in Penza province. When he was two years old, his father died. The mother hoped that his son would continue his work and gave the boy in a religious school and then to Seminary. But this area is absolutely not attracted to young Lentulov, though, and reminded myself in the future — good knowledge by the artist of Russian icons from here. Soon Aristarchus left the Seminary and entered the Penza art College and continued her studies at the Kiev art school. That he with Kiev is not formed, is usually said vaguely, they say, because of the daring of his character exposed. Let us focus on the daring disposition. Aristarkh Vasilevich somehow decided to "correct and brighten" a study of the teacher Seleznevathe logical continuation of what has become a farewell to Kyiv and return to the Penza school, which he successfully completed (probably not more trying to learn to draw teachers). Tough character of the master appeared and when trying to enter the Academy of arts in St. Petersburg. Taking the entrance exams, he wrote the model. A passing teacher quipped: "Where were you, young man, I saw on the nose of the model to the green?". Lentulov in response brazenly declared: "Don't you see? In this case, I feel sorry for you!". Indeed, the color he saw clearly in a wider range than traditionally accepted. The faces of his wife and daughter: green, blue, grey, crimson, blue — choose any! After the antics in the exam you can safely collect things and to return to Penza, but intervened a happy occasion. Obstinate applicant noticed Dmitry Kardovsky and invited me to visit their classes informally, without passing exams and getting a diploma. The artist remains in St. Petersburg and met with the futurists — Burlyuks, Kamensky, Konchalovsky. 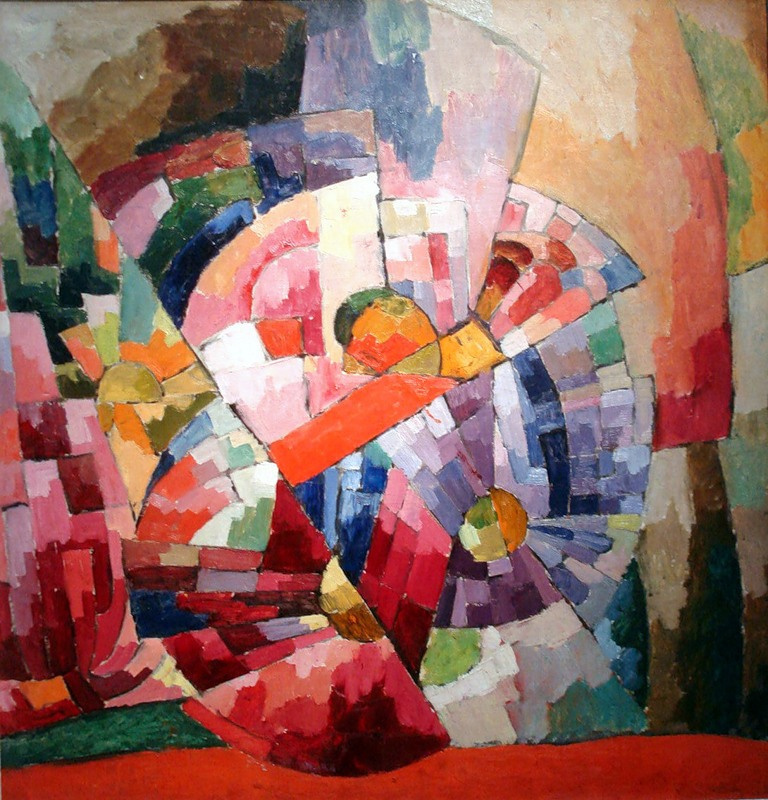 Aristarkh Vasilievich Lentulov exhibits his paintings, including the very first Russian avant-garde exhibition "Wreath". In these years (1908−1910) in his work the influence of the symbolists and Impressionists. Aristarchus was impossible not to notice. Huge hero (which he ironically displayed in the portrait "a Great artist"), a little clumsy, totally natural, good-natured and optimistic. A kind of "sound guy" from the Penza village, according to the description of Abram Efros, "big and broad-shouldered, with a booming voice and sweeping gesture, with the education of a seminarian-Bursak". In 1911, the artist decided to continue his education in Paris, he entered the Academy of painting "La Palette", he is fond of works by eugène Delacroix and théodore géricault, and Fernand Leger and Henri Le Fauconnier strikes up a friendly relationship. The French nicknamed Lentulov "futurist a la russe". A particularly strong influence, which came later, had on the artist Robert Delaunay. 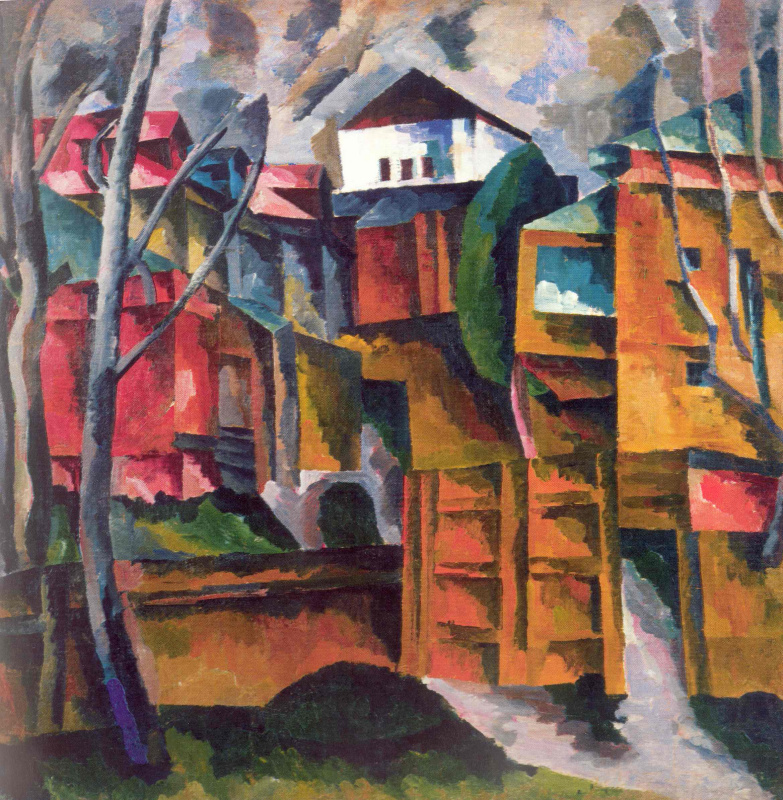 Cubism became Lentulov discovery and inspiration. Upon his return, he creates a series of paintings in which space is abstracted, and the color richness and saturation play a major role ("Asters"). 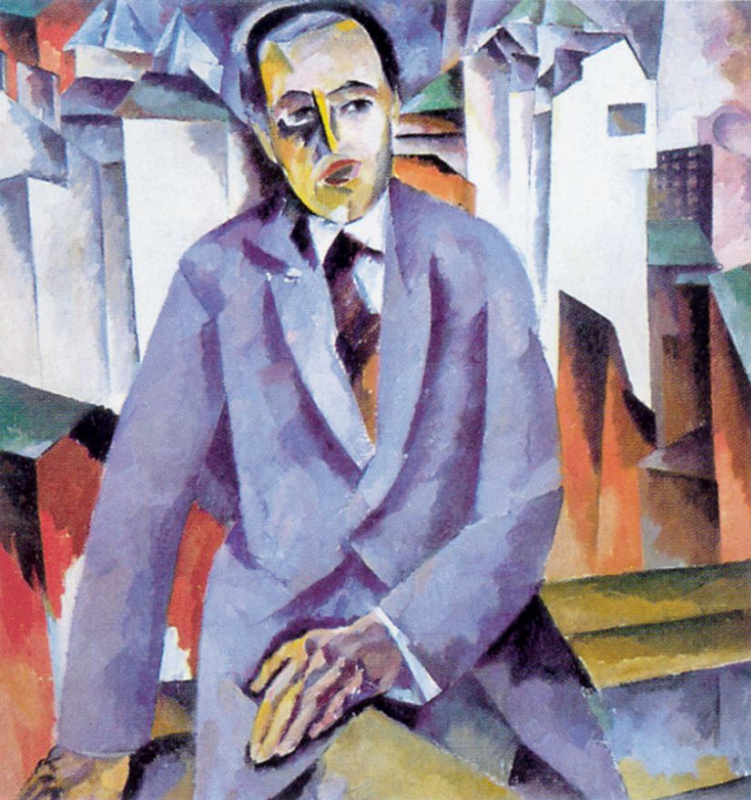 In Russia Lentulov returned in 1912. Familiarity with Western masterpieces like untied his hands, he wrote easily, fluently, enthusiastically, generously filling her paintings with sunlight. During this period he creates a series of famous murals, the so-called architectural landscapes: "Moscow", "Ringing", "Basil". Feature them — the sense of ringing, noise, hum. Pays attention to the lit up awesome, literally fantastic light. 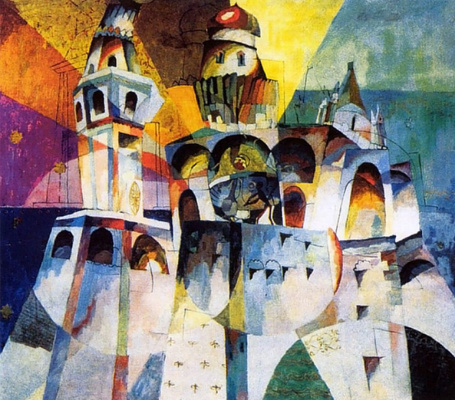 Architectural painting Lentulov comparable to folk tales, looking at them, and I want to start: "In a certain Kingdom, a country". House Lentulova at this time becoming the center of attraction. They are constantly artists, Directors, composers. Aristarkh Lentulov and his wife were very hospitable people. She was able to create an atmosphere in which I wanted to be again and again, and Lentulov just loved when guests came. The traditional parties began with philosophical conversations about art, and then, followed by wine, followed by games, charades, poetry reading, piano, songs. He Lentulov had perfect pitch and a pleasing baritone. 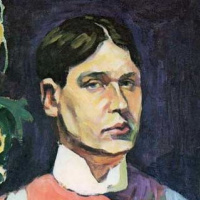 According to the memoirs of his daughter, art historian Marianne Lentulova, at work he was always singing and could sing the whole Aria by heart. The ideas of the October revolution Aristarkh Lentulov took inspiration. The idea of emigration he didn’t even come to mind, he saw his place in the new Russia. 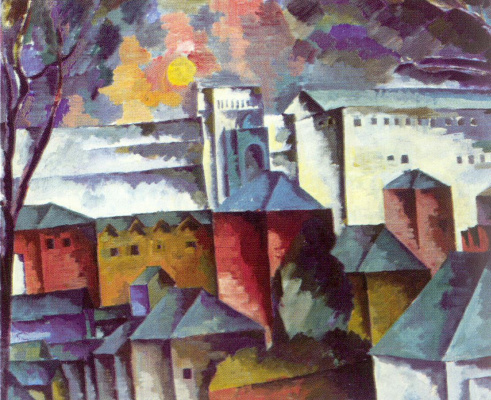 Lentulov created scenery for the celebration of the first anniversary of the October revolution. And if Marc Chagall at this time, arranged not comparable with anything graffiti on the walls, encircling Vitebsk, Aristarchus Lentulov "frolicking" in the white stone. "Who in the October anniversary painted trees and lawns, gardens, Theatre square, violently purple color with tempera, what is written in the theatre of scenery? Lentulov!" — wrote on this occasion, the art critic Abram Efros. The artist’s wife, Maria, had the property that their wives dream to see the most men. 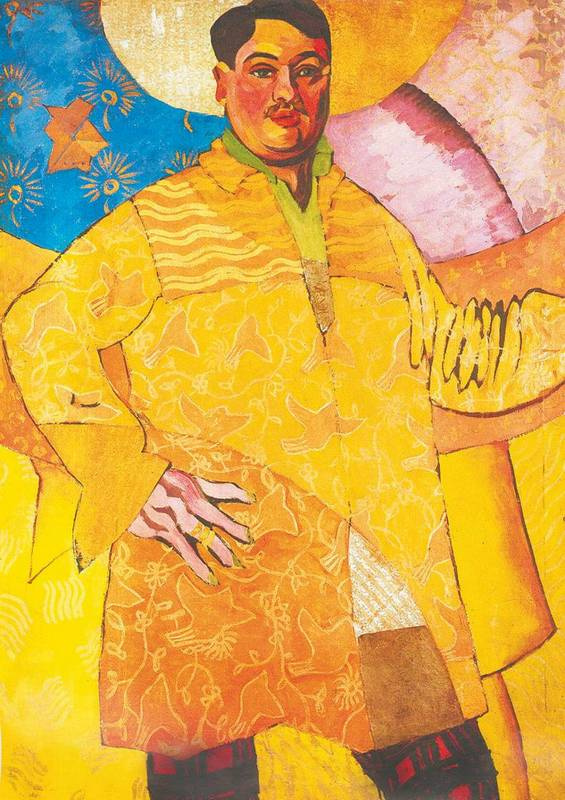 When Aristarkh Vasilievich Lentulov came and reported that after a few hours they go back-and will do so-he has even bought the tickets, she replied: "Yes, dear" - and was packing a suitcase. So, there was organized a trip to the Volga region in the spring of 1928, thanks to which he wrote a number of Volga landscapesand most importantly — brought the sun the Volga to Moscow. The researchers can’t decide who gave Lentulova nickname — the artist of the sun. Whoever he was, got to the point. 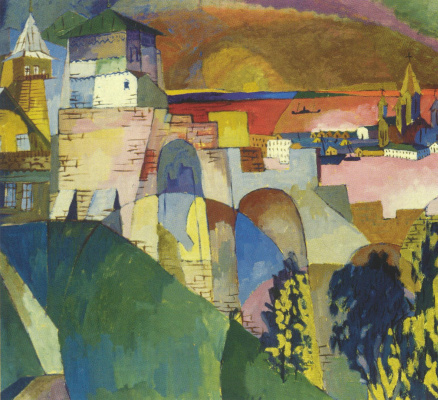 "My passion for the sun and bright light accompanied me, that is, from the day of my birth"— told Aristarkh Lentulov. The first and only lifetime exhibition Lentulov took place in the USSR in 1933. His daughter Marianne recalls that his father was very nervous, almost not sleep all night, jumped up at 5 am and went to the exhibition. There’s something rearranged, squared and… came to the Kuznetsk bridge, he saw his main object — the sun and felt that I had done everything right, passed it with flying colors. And when came to the room where the show took place, from afar spotted the tail of the queue. Absolute success! No picture was taken. Commissar Bubnov, check the exposure, the next day he came with his wife and daughter and I was at the Expo three hours. After that, the artist left in the shade. In the last years of his life he turned to socialist realism. In Soviet times it was customary to comment on that as "gained maturity and your real handwriting", but we, not being bound by considerations of censorship, note that his paintings seemed to have left the sun. However, now some of them are valued highly. "Images of the generation" in 2011, was exhibited at Sotheby’s in London for half a million dollars. However, wishing to buy a picture was not found. But in 2013 "The Church in Alupka" (which, of course, not socialist realism) went at Christie’s auction for $ 3.5 million. And in 2014 for $ 3.5 million at Sotheby’s was sold "Children with umbrellas". And it was the record prices for paintings Lentulov. 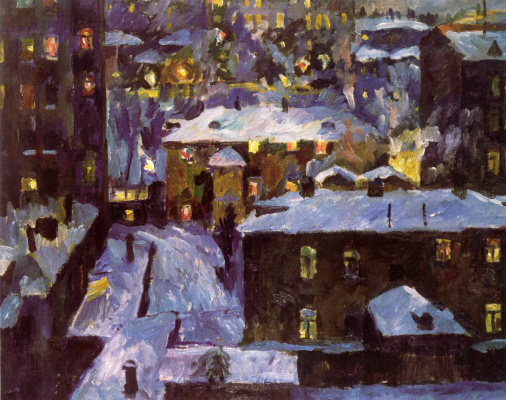 The best paintings of Aristarkh Lentulov represented on the portal Archiv devoted to art.